Be prepared! It’s gonna be cooooold next winter. I know, I know, you haven’t even seen my summer forecast yet — that’ll be coming your way in a couple months — and I’m already jumping ahead to the end of the year. I do so because I want to share more of my forecasting process, so that you can understand how it is that I can look over months in advance and see the weather coming our way. 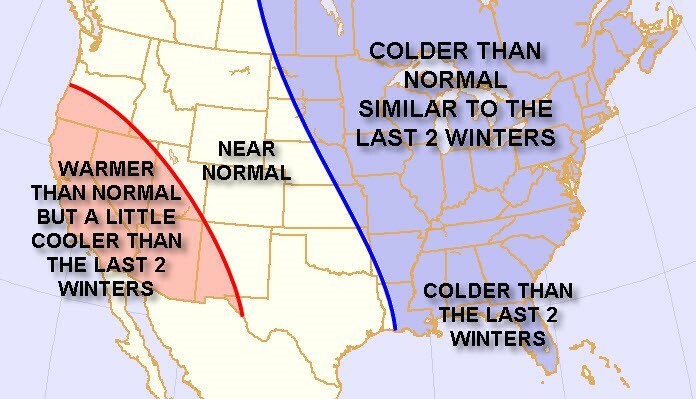 Assembling a seasonal forecast is like putting together a global puzzle. The pieces include ocean currents and the jet-stream pattern. And there are ocean temperatures to watch, which, to me, are most important because they influence the jet stream. And, just so you know, some meteorologists believe it’s the other way around — that the jet stream influences the ocean patterns. I’ve been in a conference room filled with meteorologists arguing about it! I find the first piece of the puzzle by using the Hovmoller diagram to track the current trend in the jet-stream wind flow. This week, I used that Hovmoller diagram to see what the jet stream will cause on a large scale — strong storm systems, periods of fair weather, cold snaps and heat waves — through June. The second puzzle piece is to figure out the ocean-temperature patterns. Once I combine what I know about the June jet-stream pattern and the temperature patterns across the Pacific Ocean and Atlantic Ocean, then I can look for similar patterns in the past — and that gives me a peek into what we can expect later in the year. I get my Pacific Ocean temperature numbers by studying the Pacific Decadal Oscillation (PDO), which I discuss in-depth in the spring weather forecast. Right now, the PDO is forcing warmer water to sit over the eastern North Pacific Ocean and cooler water over the western North Pacific. There’s no indication that the pattern will shift in the next year, so I expect the jet stream to arc from the Central North Pacific to southern Alaska and then across the northern Great Plains — the same path it took the past two winters. Looking to the east, the Atlantic Ocean is pretty cool right now. Most of the areas on the European side are 2 to 4 degrees chillier than normal, and some of that chilly water should flow westward to the Bahamas, then move north along the Gulf Stream during the fall. The cool Atlantic Ocean leads me to believe the jet stream will continue from the Northern Great Plains to the Southeast U.S., bringing cold air further south than we saw this season. The third piece of the puzzle is the Great Lakes: Right now, 80% of the surface area of those five lakes is covered with ice. Even after the last of the ice melts in May, the water will stay cold. That means it won’t take as long for ice to cover them again next winter. When the Great Lakes are ice-free during winter, they act to modify the Arctic air that flows over them. But once they are covered with ice, Arctic air can flow unhindered toward Pittsburgh, New York and Boston. The fact that they will likely freeze over earlier next winter does not bode well for the East Coast and Atlantic Seaboard. The last piece in my puzzle is El Niño, which will be transitioning to La Niña next winter. Combined with a cool North Atlantic Ocean, the transition has a tendency to produce chilly weather over the northeast half of the country. So what does all of this tell me? Well, next snow season the U.S. is going to experience a colder winter than it saw over the last two years, which were pretty darn cold. Remember last year’s seemingly unending stream of polar vortices … and the massive amounts of snow that blanketed parts of the East Coast this year? Next year is already looking worse, and this time the South is really going to feel it. Folks northeast of the blue line are going to be chillier than normal. Folks southwest of the line are going to see near-normal temperatures. And precipitation should be close to normal nationwide. The bottom line, as Jeff said in last week’s alert, is that the East Coast should be saving now for a sunny Caribbean get-away next winter. If you thought this winter was bad, then you’ll want to find a nice, warm place come December. On the bright side, this upcoming rough winter means we’ll have plenty of winter-related trading opportunities. Last winter, we notched multiple triple-digit winners. I’ll have more for you in my regular winter report later this year, but while we were still dealing with the icy tentacles of the current snow-and-ice season, I wanted to let you know what’s coming.